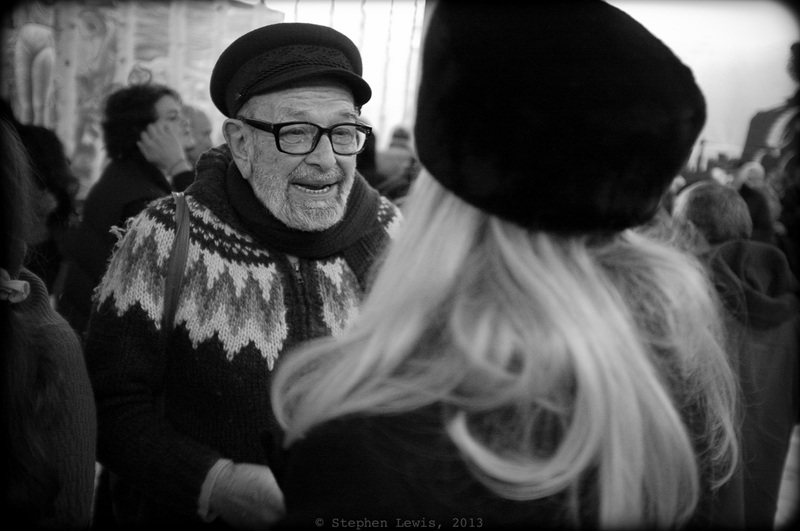 In the center, in one of his signature Hell’s Angel-style caps, polymath and newly-minted octogenarian and maker of his own documentary films, Georgi “Johnny” Penkov, December, 2013. (Fuji X100, 1600ASA, “in camera” JPEG.) Click on photo to enlarge. Wednesday evening I attended the premiere of two films in Sofia, Bulgaria, timed to honor the 80th birthday of Georgi “Johnny” Penkov — acoustical scientist, film sound man, humorist and raconteur, and, more recently, documentary film maker in his own right. The first film was one Johnny shot, edited, and produced solo: “My Mahalla,” a characteristically humorous and touching, commentary-free sketch of details, rhythms, and sounds in the street in which he has lived his entire life (Mahalla being Turkish and colloquial Bulgarian for neighborhood). The second film was one in which Johnny had served as sound man: “One Rainy Day,” an emotional and delicately shot portrait of the brilliant, energetic, but, in recent years, reclusive, Bulgarian guitarist Ognian Videv, an autodidact and eternal “Filibeli” (after the Turkish word for a denizen of the city of Filibe — Plovidiv as it is now called — in Bulgarian Thrace). 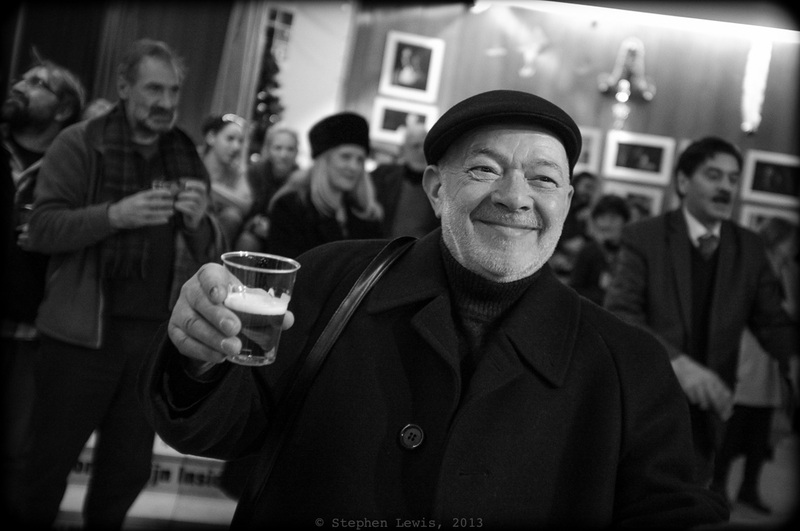 Legendary guitar virtuoso and life-long “Filibeli” (see body text for definition), Ognian Videv, wearing an English-style Kangol and holding, in lieu of his signature guitar, a signature glass of beer, December, 2013. (Fuji X100, specs as per above.) Click on photo to enlarge. The premiere drew an older audience of past-generation Bulgarian “tvortsi” (“creatives,” as they were called during the communist period). Some had been self-indulgent hacks and pretend former- dissidents in days gone by, contemptuous of ordinary people who work but incapable of working themselves. Others, however — like Johnny, Ognian, and the great Bulgarian-Jewish comic and dramatic actor Itzko Finzi (whose photo I unfortunately neglected to take) — were and remain hardworking, productive, world-class talents. They are also people from whom I learned much. It was Johnny, for example, who taught me that being a polymath is a specialization as worthy as any other (!) and who gave me the courage to continue on the path towards becoming one. Not least, Johnny also honed my search for humor and insight in the small details. 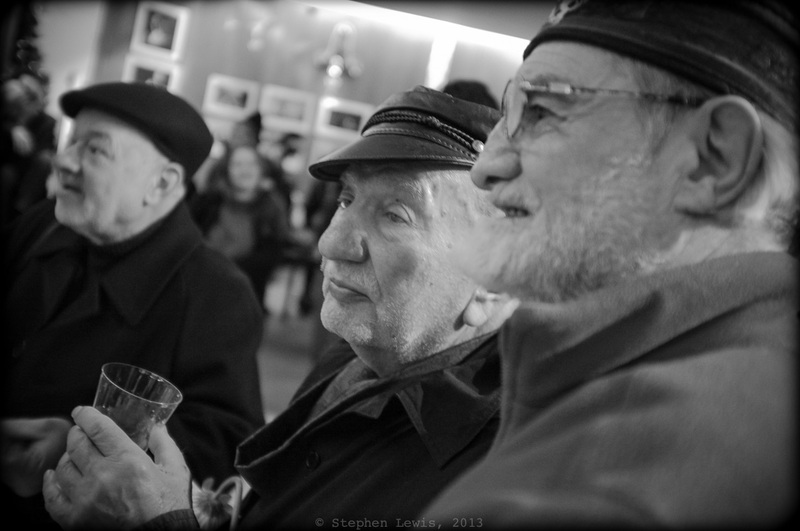 In the days when many attending the premiere were far younger, hats were de rigeur for Soviet bloc “creatives” and were worn by some as a signature sign of their talents and by others as surrogates for real personae of their own. Thus, five hats, each representative of people in the first category, are featured in the accompanying photos. One-time cineaste and eternal charmeur Doncho Papasov earned his right to a “Greek fisherman’s” hat by actually having once sailed solo around the world. The faux-fur “kalpak” atop the head of blonde hair in the foreground added to the evening a “Ninotchka”-like touch of nostalgia and elegance. (FujiX100, specs as per above.) Click on photo to enlarge. It was either laziness — or preoccupation with conversation with dancing, conversation, and decent wine at the reception following the screening — but the photos posted herein represent some uncharacteristic cutting of corners on my part. 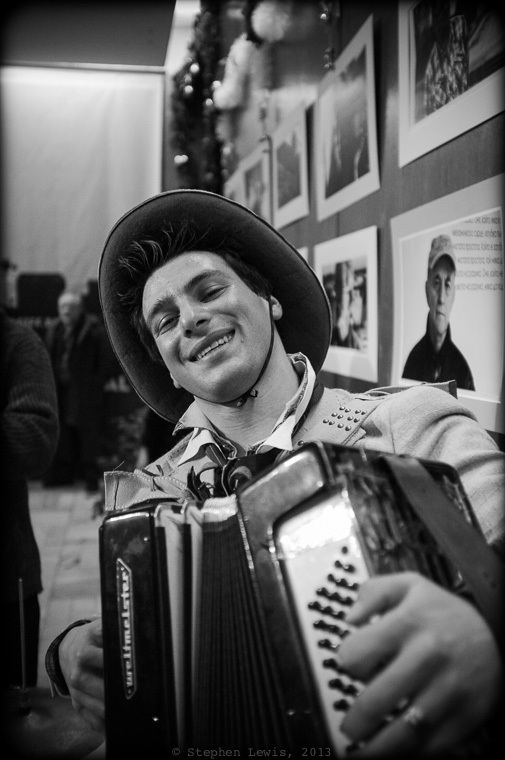 Music at the premiere was provided by Jesus Kotsev, a high-spirited, virtuoso Roma (Gypsy) accordionist, who goes by the very non-Bulgarian, non-Roma stage name of “Jimmy Accordeon.” Jimmy reinforces his seemingly American moniker with a seemingly American cowboy hat. Johnny invited Jimmy to the premiere after hearing him play on the street nearby. Blame it on Jimmy that I danced more than I photographed! (Fuji X100, specs as per above). Click on image to enlarge.